Let me start out by warning you that this is a looong post. 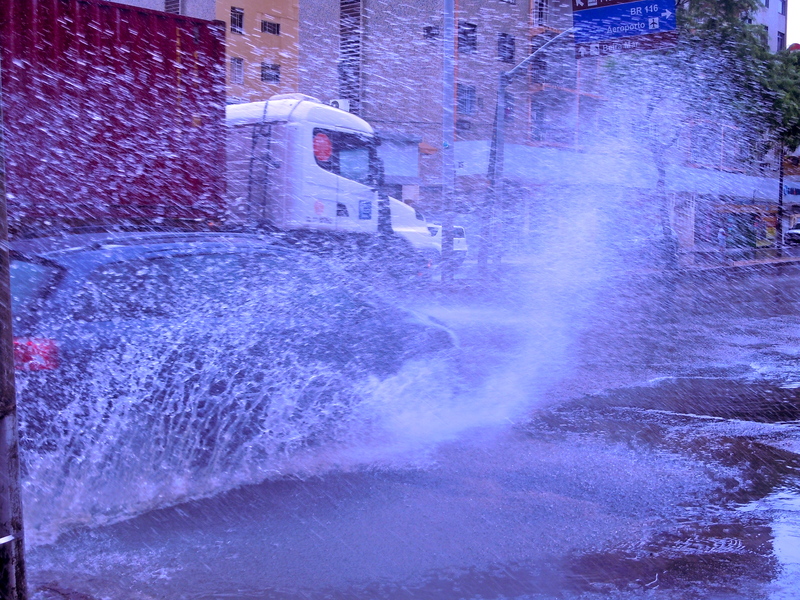 It goes all the way back to Rio with a little bit of Cearense rain thrown into the mix. Ok. I come from a relatively small town where public transportation, while it exists, doesn’t really play a prominent role in my life. Thanks to the amount of time I’ve spent in cities like New York and Boston, I can navigate subway systems quite easily and rarely get lost due to the fact that they lay out a map in plain sight and they ALWAYS take the same route and stop exactly where they’re supposed to stop. Buses on the other…not so much. For some reason, buses and myself just don’t get along. Now that I’ve been in Brazil for almost four months, the situation is getting better. My first month dealing with buses was quite the saga. It took me forever to figure out which buses I could take to get to different places. 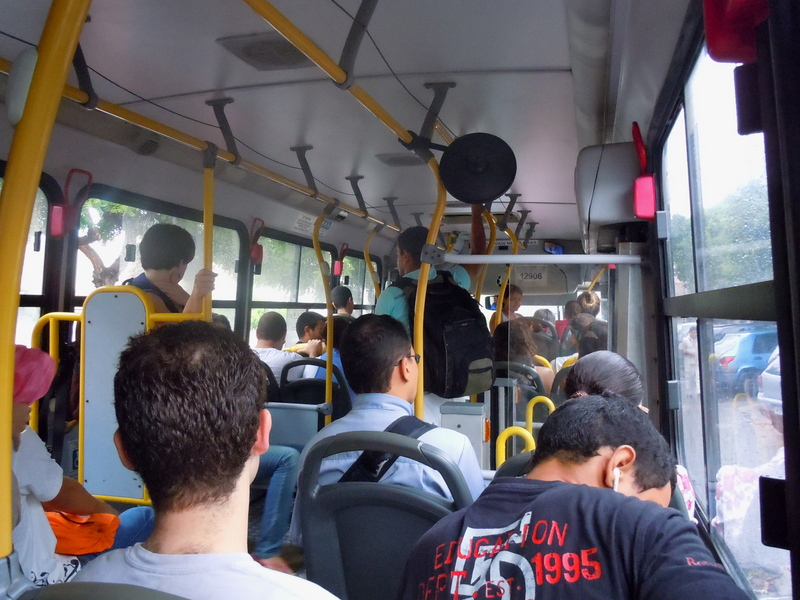 To get from my homestay in Rio to the PUC campus, there were a bazillion possible buses to take. I just had to make sure that the route listed on the bus included PUC. After the first week, Cindy (my roommate in Rio) and I figured out that it took us somewhere between 10 and 20 minutes to get from Humaitá to PUC, depending on how crazy our bus driver was: 20 minutes for a normal person and 10 minutes for someone who drove a giant bus like they were racing and weaving in and out of cars on the Talladega speedway. During one of these instances, I was holding onto my seat for dear life, looked to my left out the window and saw the side view mirror of the bus next to us about an inch away from my face. Terrifying. Oh and I’m fairly certain the bus drivers of Brazil have an ongoing competition to see who can stop on a dime the fastest while leaving the least amount of room between them and the car/bus in front of them. 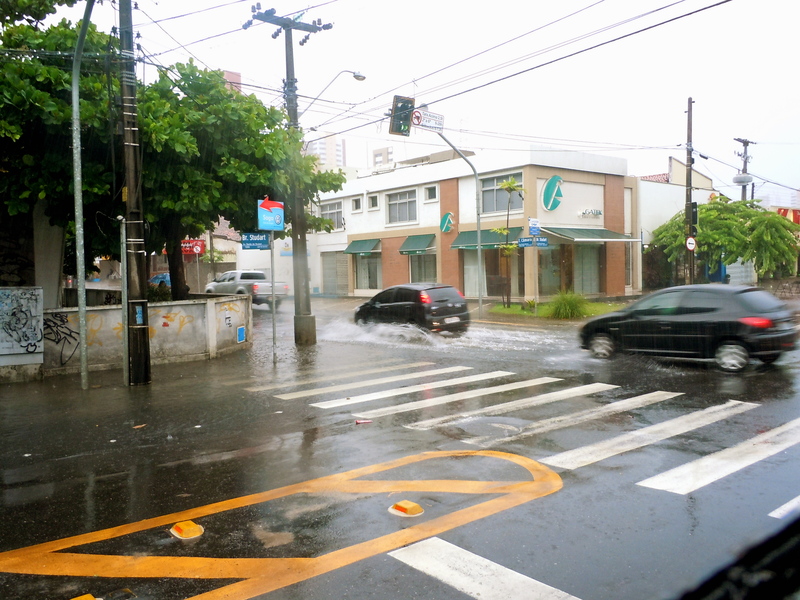 Most of the buses we took to school just went straight down Rua Humaitá all the way to PUC. Of course I just have the best luck in the world, so on the day of my oral presentation I still managed to screw things up. I left the apartment about 20 minutes earlier than usual to ensure that I would arrive to class with plenty of time to set up and relax before my presentation. The bus I jumped on had other plans for me. It definitely said its final destination was PUC, but there was no way for me to know that it would take a 30 minute tour around the lagoa, through Ipanema and Leblon before heading to PUC. I got to class my usual 10 minutes late and started apologizing profusely to my teacher. There was just no way to explain my bad luck with buses. 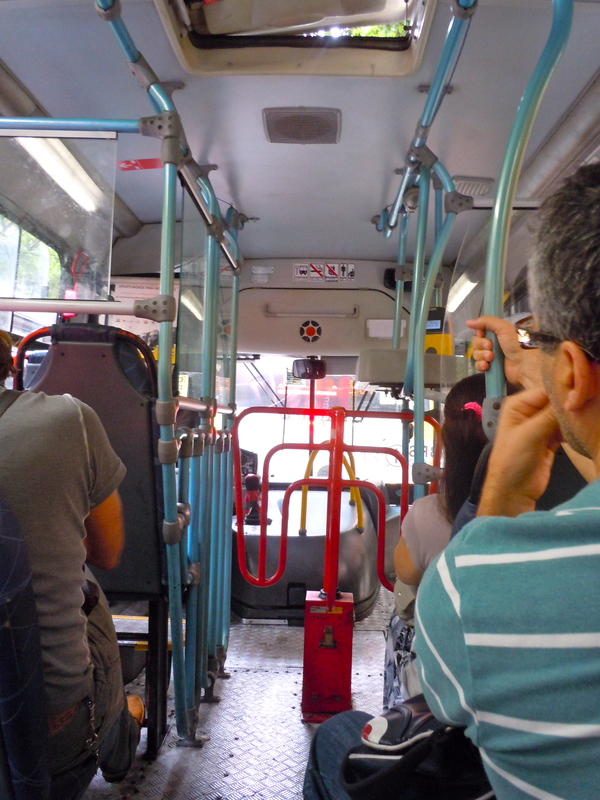 One of the hardest lessons I learned in Rio about buses is that you have to pay attention to both the number of the bus AND the current destination listed. On our way back home from Niteroí, Lara and I made the lovely mistake of just looking at the bus number. Consequentially, once the bus headed out of the city center towards the hills, we hit full freak out stage. The bus ended up taking us to some random rodoviaria and stopping there. We were the last ones sitting on the bus because we didn’t know the bus wasn’t continuing on from there. And it was possibly one of the sketchiest areas I had ever seen in Rio up to that point. We ran for the nearest bus that was on that said Copacabana even though we were trying to get to Leblon. It didn’t really matter as long as we got out of there and headed somewhere we knew well enough. Few days later, I was trying to figure out how to get to Ipanema from Humaitá by just one bus when I got on the correct bus, but going the wrong way once again. This time I was by myself and ended up in another sketchy area of Rio all alone. Finally I found a bus going where I needed to go, jumped on it and headed back to the parts of Rio I knew. anybody have a kayak i can borrow? If I thought all my bus problems were over by the time I got to Fortaleza, I was wrong. I’ve already told y’all the story of jumping on Grande Circular #51 rather than Circular #11, so I won’t reiterate that one. Even though it’s hysterical now that I look back on it. I finally have enough experience messing up with the buses that now I stare long and hard at a bus before I jump on it. I’m even paranoid that I got on the wrong bus the whole time I’m on it. One of the quirks about the buses here in Fortaleza is that the bus drivers don’t always stick to their routes. So one time Lara and I ended up walking back home for about 10-15 minutes after the bus driver decided to skip the part of his route that included our neighborhood. I still haven’t decided if I think its more fun or life threatening when the buses I’m on take corners so quickly they’re only on two wheels. One time I was coming back from the Benfica campus rather late so there were only a couple people on the bus aside from myself. The cobrador (the guy who takes your money when you get on) came up to the front of the bus and started egging the bus driver on, chanting “rápido rápido rápido! !” I was like “no! no! NO!” I’m fairly certain the bus caught air going over a few bumps and I was 100% certain we were going to roll when we hit the big curve. After I got off the bus, my heart rate was sky high and the adrenaline was pumping through my veins. It was terrifyingly exhilarating haha. Then there’s the rain to contend with. 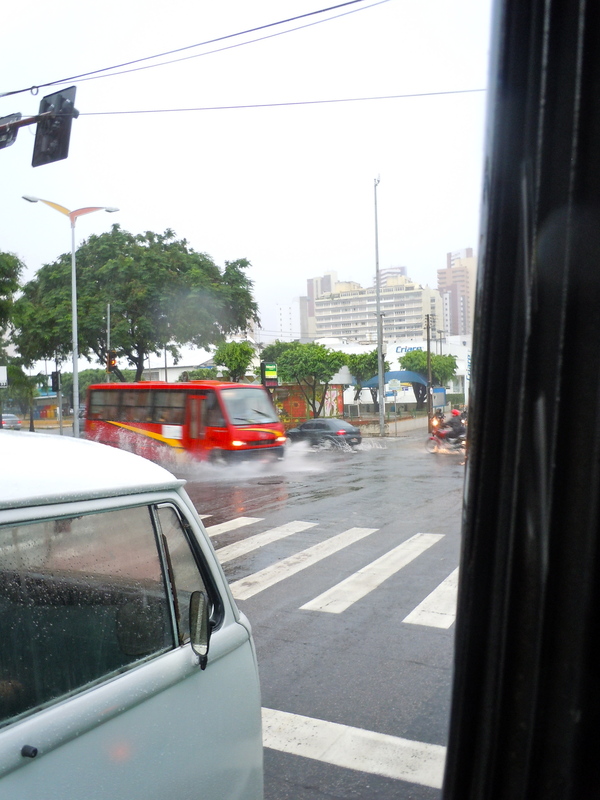 Now, buses in Fortaleza don’t have AC so when it pours outside, everyone slams the windows shut and the body heat makes the inside steamy, humid and unbreathable. The rain also has a nasty habit of seeping in through the windows anyway so if you sit next to the window during a torrential downpour, you’ll probably end up wet anyways. If your outside, standing on the sidewalk during the rain and a bus drives by, your better off with your umbrella in front of you rather than over your head cause the waves cause by the bus speeding by will drown you haha. 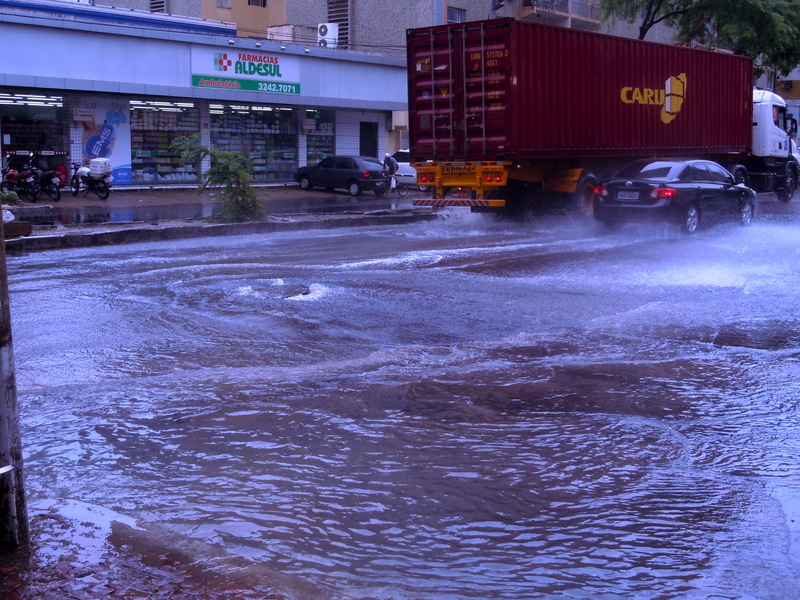 One of the worst mornings of rain we had resulted in flooded streets that the buses sped through anyways. This was also the morning my flip-flop decided it wanted to go rafting down the highway rather than stay on my foot as I dashed across to school. I looked ridiculous running with one shoe on trying to catch my other one, all the while failing to stay as dry as possible, giving up on the usefulness of my umbrella, trying to avoid being hit by multiple buses, and laughing at how ludicrous the situation was. Thankfully some really nice random stranger managed to fish my flip-flop out of the road and throw it to me just before a bus ran over it. Well I hope y’all enjoyed the rather random wrap up of my bus stories. As crazy as the situations tend to be, they always result in some of my favorite stories. ~ by dfsg1991 on April 23, 2012.